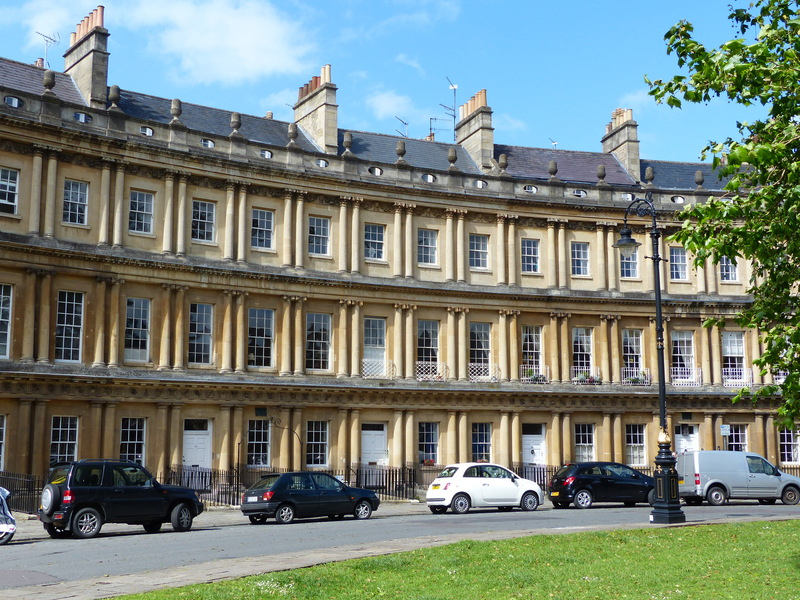 Beautiful Bath – Run. Ride. Roam. He laughed and checked again if we needed anything, then said he’d leave us to it. What a super nice man! 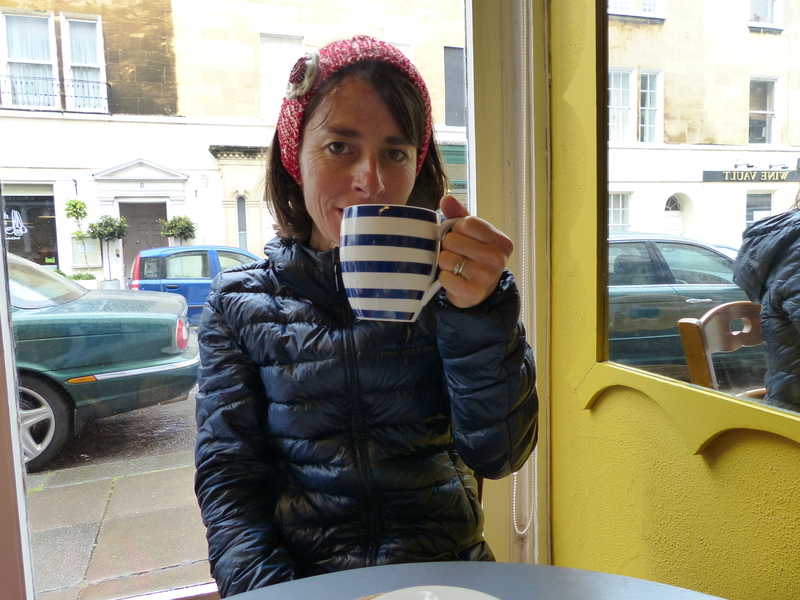 While we waited for the washing to do its thing, we popped around the corner for a cuppa and I got have a mug of tea in a blue and white striped mug, another English thing I had to do. It wasn’t quite the big chunky “caff” style blue and white mug of stewed tea I was looking for, but I can’t have everything! It was a very nice little cafe and a very nice cup of tea nevertheless and we had a peaceful spot of elevenses while the washing sloshed around the corner. A nice big mug of tea in those blue and white stripes! 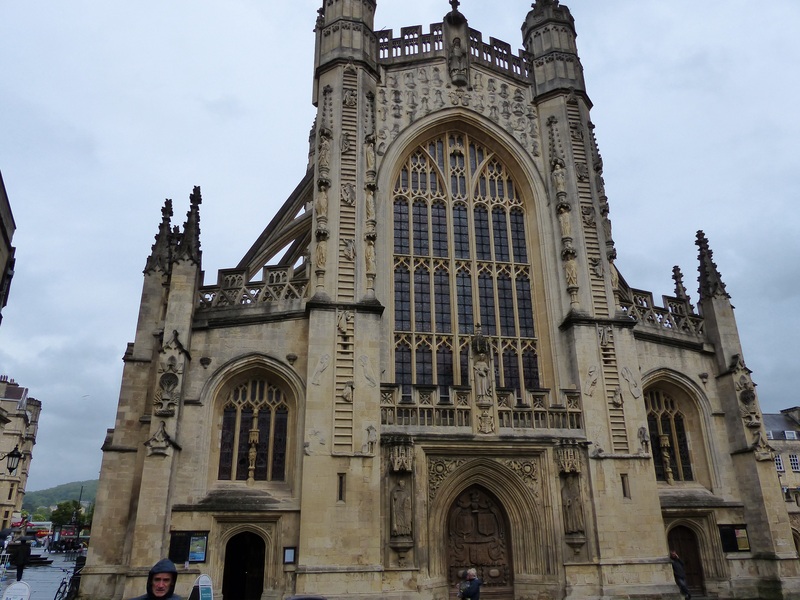 When we’d finished our housekeeping, we set off into the rain and wind to roam around Bath. What an absolutely beautiful city! I just love it! 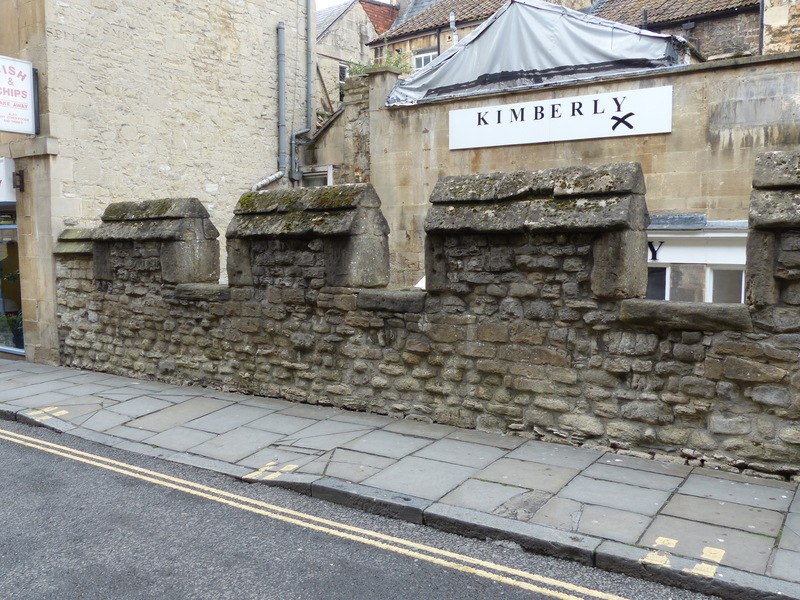 It has gorgeous buildings, lovely flagstone pavements, little alleyways and lanes and such a rich history. It’s just a wonderful place. We decided to do a walking tour, which are offered free by the city. I thought it was interesting that they were absolutely, 100%, fair dinkum free! We did a free walking tour in Paris, but we were told from the start by our guide, that a contribution was welcome and left us in no doubt that it was somewhat expected, when she said the usual tip was about 10 Euro per person. Yes, you could technically just leave at the end without paying, but it wasn’t really set up for that to happen! So our “free” walking tour still cost us 20.00. 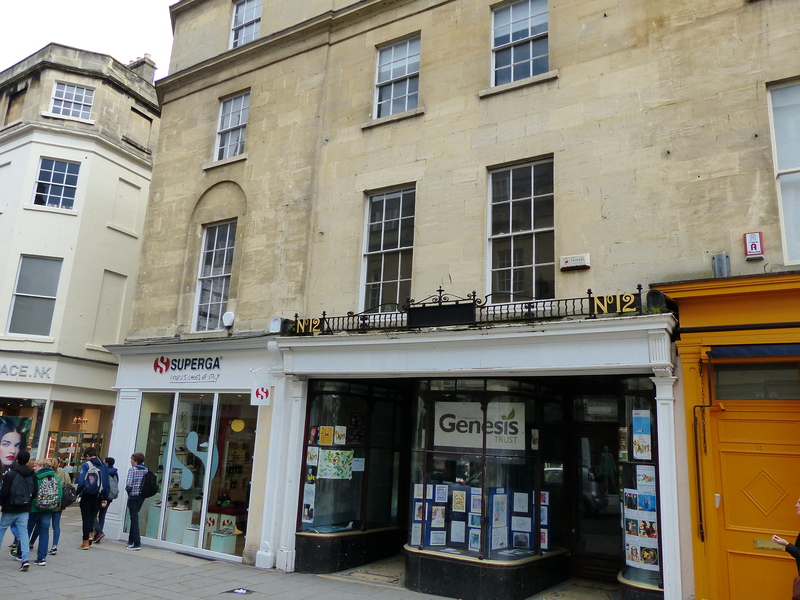 The one here in Bath though, said on the sign and we were told again by our guide, that tips would not be accepted and she wasn’t allowed to take any money. So it was a genuine freebie! It was a terrific tour and a nice two hour walk with Judith, our guide. 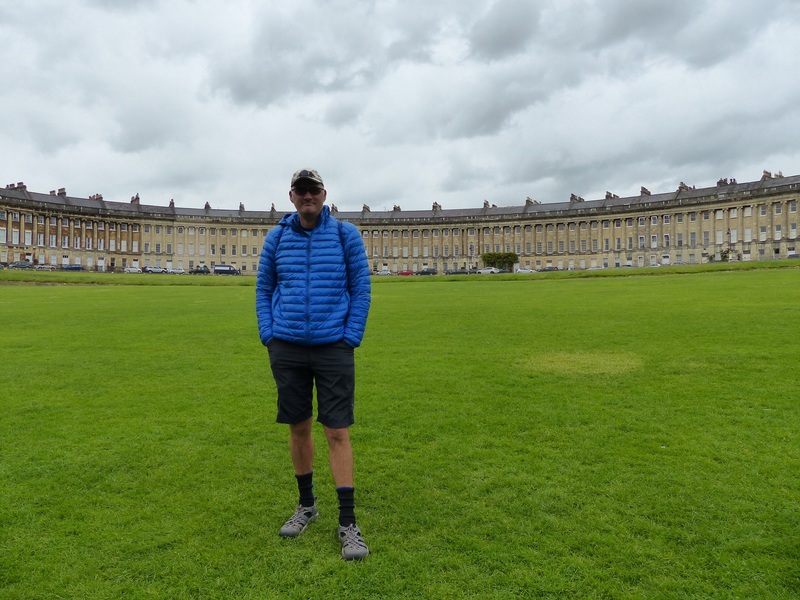 We walked around the lower city and then up the hill to the Royal Crescent and the Circus, with their beautiful architecture and the weather did improve, which was really welcome! 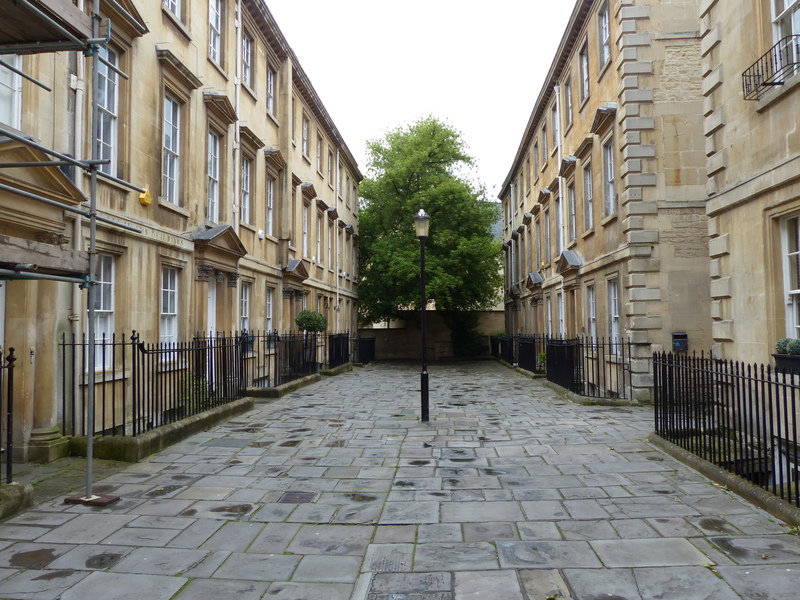 The original streets of Bath are twenty feet below the street level of today. 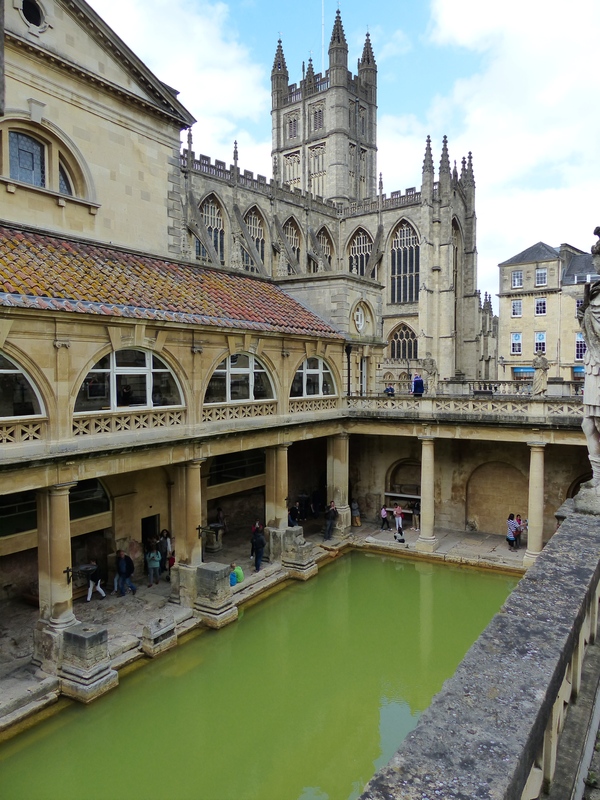 The Romans ruled Bath for about 400 years, but when there was trouble on the continent, the Romans left and headed back to the mainland and they expected the locals to maintain all the buildings and infrastructure they’d left behind. Well, the locals hadn’t been too keen on the Romans, so they completely ignored everything that was left behind and the houses, buildings and churches just fell into disrepair and fell down. Then the river rose and the silt rose, covering what remained of the Roman city, so the actual streets from that time have been buried. Judith showed us an arch from the original street, that had been discovered, and we had to stand and look down on it, that’s how far below us the original Roman street was. During the 18th century, the councils of that time imposed various taxes. There was a hearth tax and people paid tax for each hearth they had in their house. Some houses of the wealthy had as many as seventy hearths! So the council’s revenue did very well from them! There was a wallpaper tax! It was thought that wealthier people had wallpaper, so people had to pay tax according to the amount of wallpaper in their houses and inspectors went from house to house and stamped people’s wallpaper to say it had been inspected. Well, what people did was, put up a small piece of wallpaper and after it was stamped, they just rolled out more, which they then didn’t pay tax on, because they’d already been inspected and been stamped. So the council of the time got around that tax evasion by stamping the wallpaper at both ends! There was a window tax and people paid tax according to how many windows they had – the more windows the more tax they paid. If your windows were less than 12” apart though, that only counted as one window, so you only paid tax for one. If your windows were more than 12” apart, you paid tax on two windows. So a lot of people moved their windows closer together, to pay less tax! We saw where the windows had been moved and the stonework that had covered where the window had originally been. 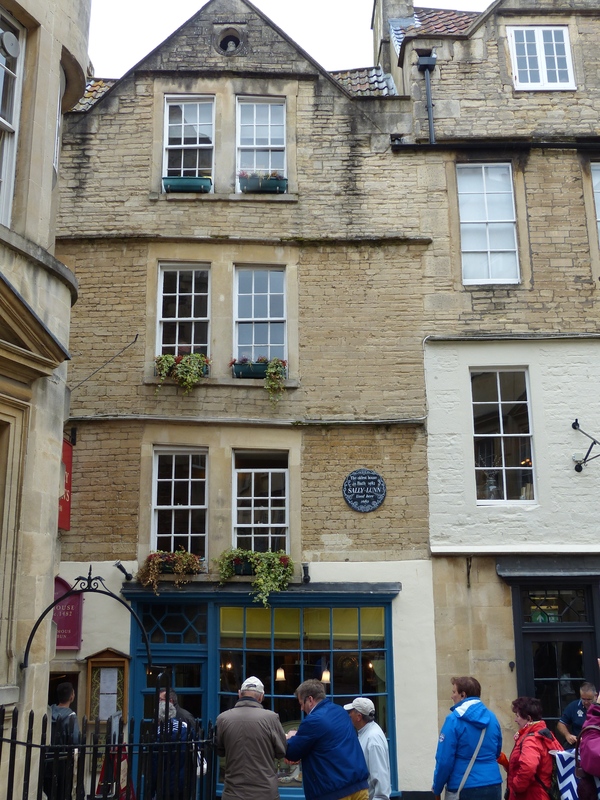 That’s where the saying “daylight robbery” comes from – from the 1700’s and the window tax! 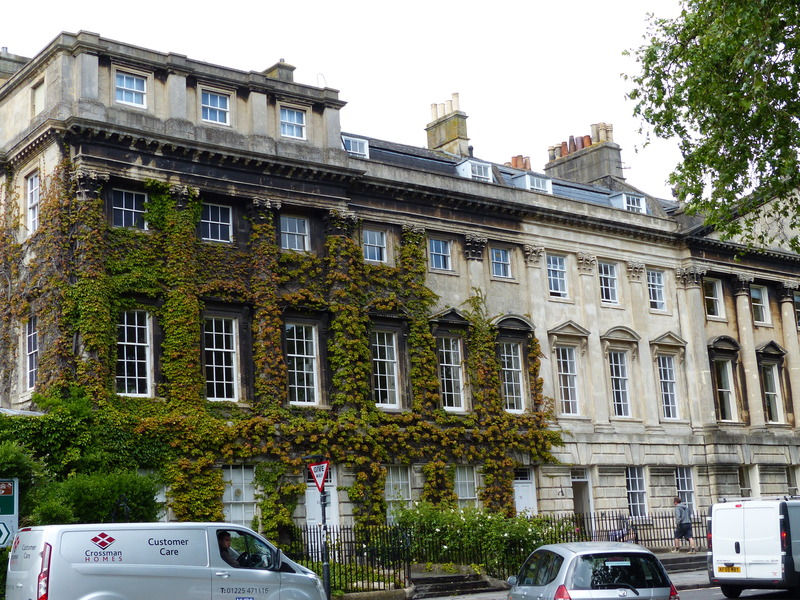 We saw a building that was originally a hospital, right in the centre of Bath. It’s now an alms house and underprivileged residents of Bath are housed there. I thought that was wonderful, that the housing for them is right there in one of the most desirable real estate locations in the city. 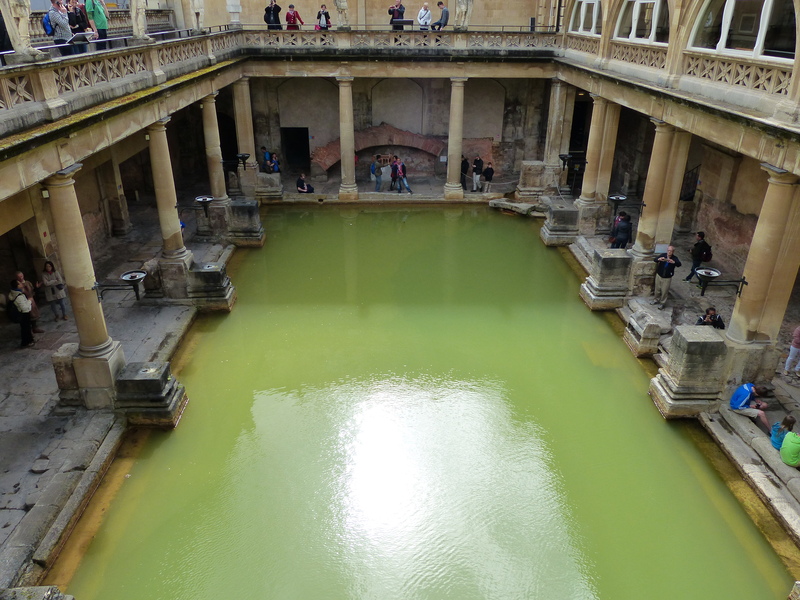 The Romans didn’t come to Bath for the springs, they came for copper, silver and wheat and it was only later that they discovered the hot springs and turned the city into a spa town. The Roman Baths were built and people would visit them like we would go to a leisure centre or spa today. It was also a spiritual and religious place with a temple and also a place where people went to soak in the water with the thinking being the water would cure their various afflictions. King Bladud was a legendary king of the Britons, who as a young man, was sent by his father to Athens to be educated. While he was there he contracted leprosy and when he returned, he wasn’t allowed to take his place on the thrown after his father, due to his leprosy. So instead, he became a swine herder! It was while he was doing this that he noticed his pigs would spend hours wallowing in the mud that had been warmed by the natural thermal springs and he also noticed that the skin diseases his pigs suffered from, were cured! So, being the smart fella that he was, he started wallowing in the warm mud too and lo and behold, his leprosy was cured! He was then able to become King and he was convinced of the healing power of the natural springs in the area. 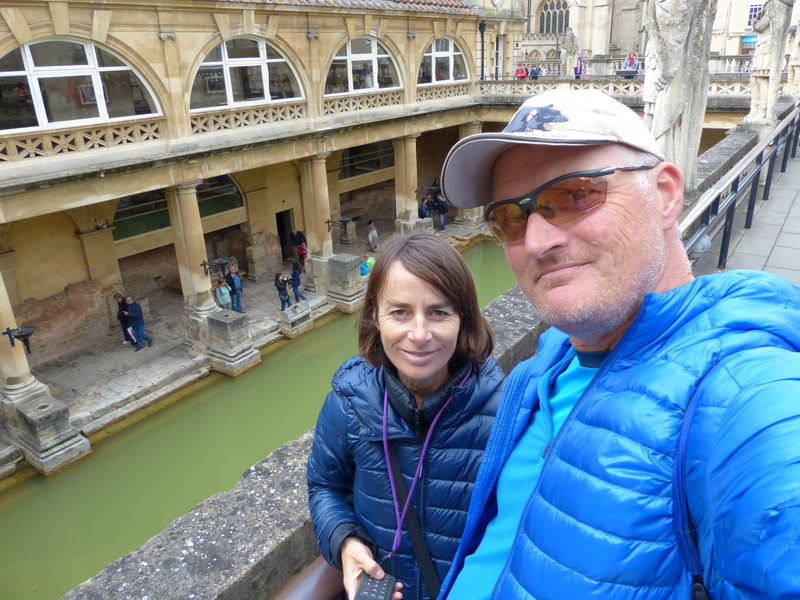 We happily roamed with our little group, hearing these stories and seeing the sites of Bath and marvelling at the beautiful city. 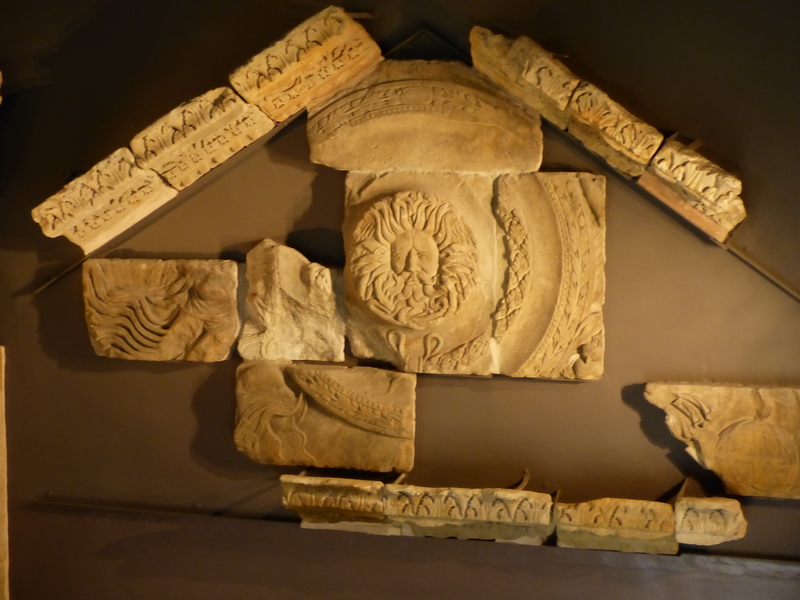 After the tour we went to the Roman Baths, which are like a museum, with the remains of the original baths still there. 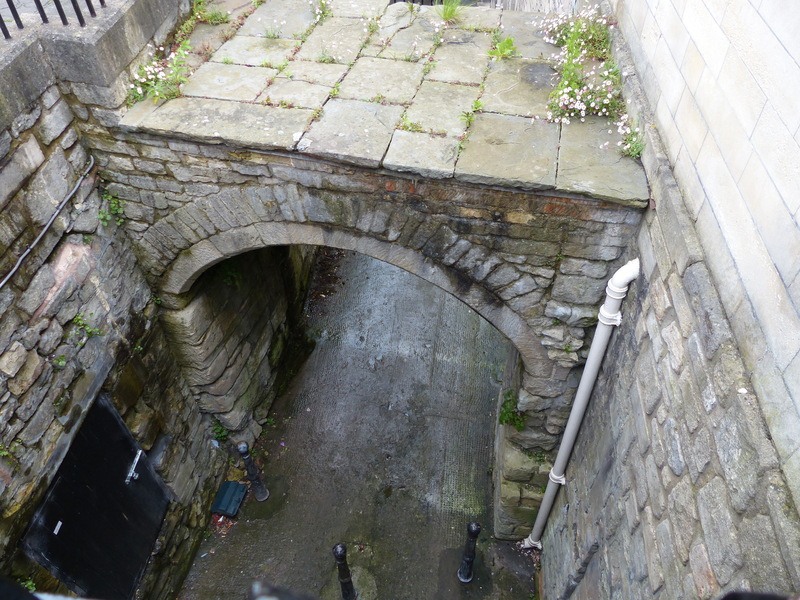 The first thing we noticed was having to go down from street level to get to the baths, again because the original Roman city is buried so far below the current one. We saw the grand pool, where people would swim and splash around, like we would use a public pool today. There were also the various pools where people would just sit and use them therapeutically. It was fascinating to see something that old and to see examples of that amazing Roman engineering. The front of the baths was also originally a temple, where people would worship and sacrifices were made and parts of the original temple facade were still there too. 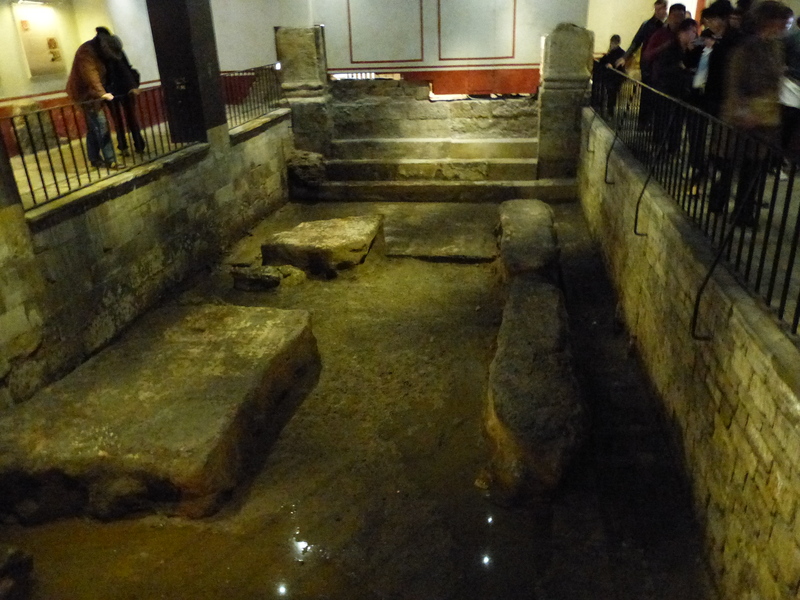 One of the pools where Romans would walk down the stone steps into the warm water and soak away their afflictions! 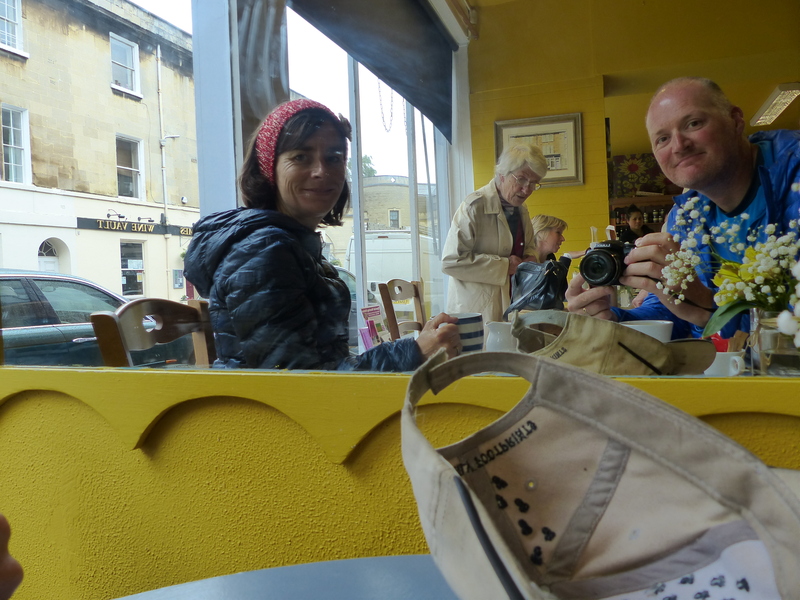 The other thing we discovered about Bath is there are a lot of Australians here! We’ve heard Australian accents all over the place! 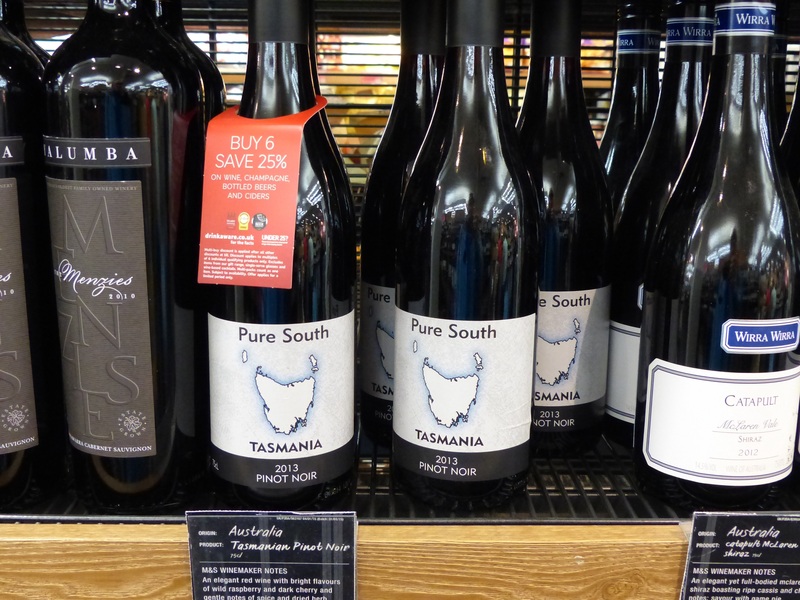 Oh, and later when we went grocery shopping at Marks and Spencer, we saw Tasmanian wine on the shelf too! We had a great day. I love Bath! It was wonderful to walk around the city and just take in the beautiful architecture and the historic surroundings. I could spend quite a lot more time here if I was able. We’ll be moving on though and tomorrow the weather is supposed to be fine!! If that’s the case we’ll make the most of it and start pedalling, but we have discovered the weather is a bit of a trickster so who knows what it will actually be like! We are also supposed to have a canal path to follow, which will be lovely, so I hope all of that happens, because a nice fine day along the canal will be delightful! So we shall pedal on, taking in more of the sights and experiences of these wonderful places we have been lucky enough to visit or pass through so far. We’re not just touring, we’re experiencing! We are seeing and hearing and feeling and just absorbing the character and atmosphere and personalities of towns and villages and connecting with places and the people. It’s so excellent! It’s just brill! 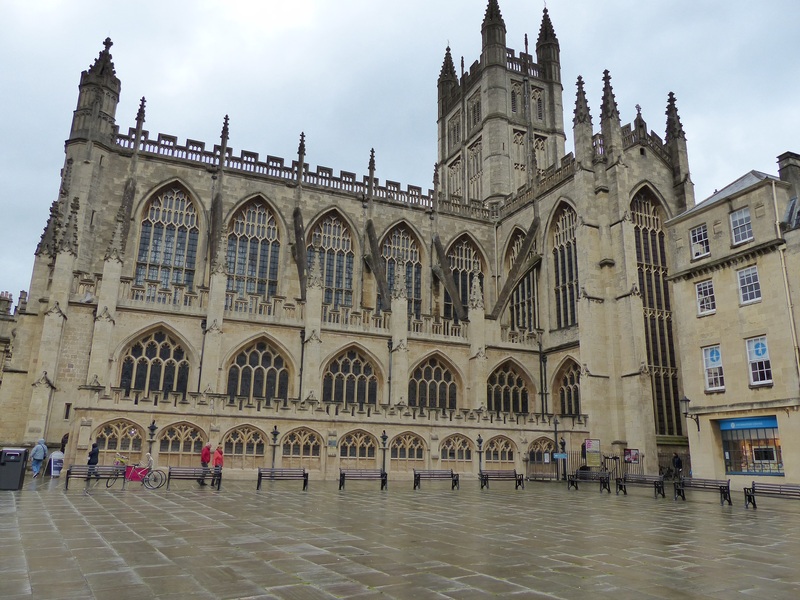 I loved Bath and yep, it had a lovely feel. The sun did shine!